PHENIX Vertex Detector is under construction. Pixel ladders are being mounted. The detector will be operational at the end of 2010. Welcome to our home page. The Radiation Laboratory is one of the eldest research groups in RIKEN, now belonging to Nishina Center for Accelerator-Based Science. The major activity of Radiation Laboratory is to perform an experiment using high-energy polarized-proton collisions and heavy-ion collisions at BNL-RHIC in USA, through cooperation with RIKEN-BNL Research Center. 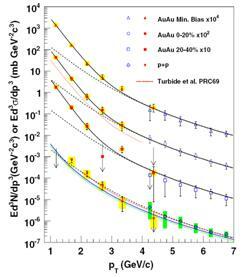 We are also performing ion-source developments and novel detector developments. 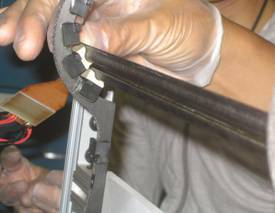 In October 2009, H. En'yo, Chief Scientist of Radiation Laboratory, was concurrently appointed as the director of RIKEN Nishina Center for Accelerator-Based Science. A. Taketani is now the leader of Nishina RIBF(Radio Isotope Beam Factory) Detector Team, to which major part of PHENIX detector development work is transferred. Our theoretical activity in QCD was transferred to newly-established Mathematical Physics Laboratory. How the spin of proton is formed with 3 quarks and gluons? This is a very fundament question in QCD, Quantum Chromodynamic. The RHIC Spin Project has been established to solve this problem by colliding two polarized protons for the first time in history. 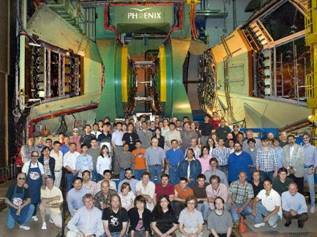 Collisions of polarized protons are measured with the PHENIX detector at RHIC. Research program is organized in PHENIX Spin Physics Working Group, and analysis of the PHENIX data is performed at CCJ combined with RIKEN super computer cluster. Recently, we have successfully detected the signal from W boson decaying into electron. W boson provides us the key tool to determine anti-quark polarization in the proton. At RHIC QGP, Quark Gluon Plasma, should be created by colliding two gold nuclei, through which we can study the state of early Universe just after the Big Bang. 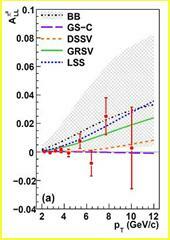 February 2010, Y. Akiba has reported, at American Physics Society Meeting, the temperature of QGP created at RHIC. We have measured thermal radiation from the hot matter and the temperature was determined to be 400MeV. While RHIC creates nuclear matter with high temperature, study of dense nuclear matter was being performed at KEK-PS, and phi meson modification at normal nuclear density was discovered. To extend our research further we proposed a new experiment E-16 to be done at J-PARC. 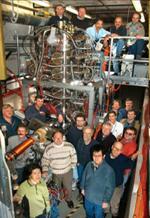 The grant-in-aid budget "New Hadrons" from JSPS was granted for 4 years to build the detector. 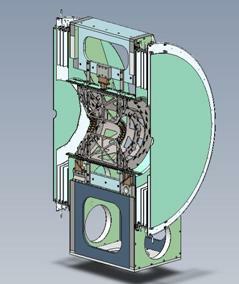 Schematic drawing of the (half of) PHENIX vertex detector, to appear soon as real. Collaborating with RIKEN venture company, JNOP (Japan Neutron OPtics), we are performing experiments of neutron interference and neutron scattering. Interference as large as 60% was observed using multilayer neutron mirrors. Clear separation of neutron paths was firstly achieved. Y.Fukao received 2010 Young Scientist Award of Nuclear Physics Forum of Japan with his work in determining the gluon polarization in proton. The data which eliminated most of theoretical models which assume large gluon polarization. H. Iinuma, former Junior Research Associate of Radiation Lab., received 2010 Young Scientist Award of the Physical Society of Japan. She was also the winner of RHIC & AGS thesis award in 2007. R. Muto, former Special Doctral Fellow of Radiation Lab., received 2008 Young Scientist Award of the Physical Society of Japan. H En'yo and S. Yokkaichi received Significant Achievement Award in RIKEN, March 2008. T. D. Lee, Director emeritus of RIKEN BNL Research Center has awarded for The Order of the Rising Sun, Gold and Silver Star �i�����d���́j, Jan. 2007. People Left from Radiation Lab.